Something occurred to me this week while I worked on this comic and the next: I could probably do a cthulhu comic full-time. I am genuinely have a blast working on these comics. I just hope my good times are translating into comics. Speaking of comics, I was lucky enough to step this week on a guest comic for Alina Pete’s WereGeek! Alina is in the midst of putting together a new book and needed some time to knock that out. Alina (and her readers) were very, very kind and appreciative for my contribution not to mention, my comic sits alongside folks such as Lar Desouza, Jeph Jacques, and John Kovalic. For a comic nerd like me, that is huge. Innsmouth: Part Two arrives on Monday! I totally read that as “ImploDing Kitten Eyes”. So far, I’ve been enjoying the crap out of these. I think you have a knack for the setting and tone here that can sometimes feel a bit off the mark in your modern day work. Just on curiosity, is the bottom left panel supposed to be “Muy” or “My”? Just a wild guess, but my first impression with Caldwell is that he speaks with an Irish accent, “Muy” being what an irishman’s “My” would sound like. Yeah, about that guest strip. It’s what brought me to your comic. Love it! Finished catching up. Discovered this from your guest comic for Weregeek. Then I thought “This seems familiar somehow”, and figured it out when the Obsidian Twilight caption comics appeared. It’s got a bit of a Downton Abbey feel, too. Very hip. Nicely done! That second to last panel…I don’t think that’s a muzzle flash! What strange cthulian artifact is she using on him?? Ooh I’m going to like this arc. 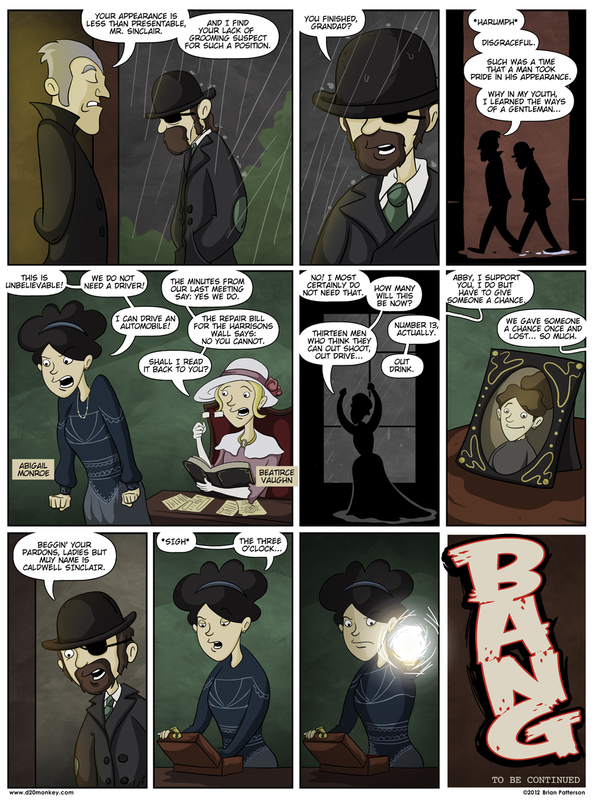 Minor spelling correction: Beatrice’s label in panel four is misspelled “Beatirce” (r and i are flipped). Bah! Thank you! I missed that one. I shall correct it when I make it home today. I must say I think it’s awesome how you take to copy corrections. Wouldn’t have mentioned it if I hadn’t seen you appreciate them in the past. Awesome panel 3 and that last panel was a builder. I’m so psyche on what’s going to happen. I love the hat. I really think the hat makes the character for Sam. It depends on how long ago the eye was lost – I know one person who was born almost blind in one eye, and he has no problems – he has compensated in other ways to figure out distances when driving.